Described as “the most famous bluesman of all time”, Robert Johnson was not only the first and founding member of the “27 club” (where other famous musicians including but not limited to Kurt Cobain, Amy Winehouse and Janis Joplin would also join); but many wanted to claim Johnson as a member of their club, including, Greenwood, Quito and Morgan City, who each claim Robert was laid to rest in their burial grounds. Alongside Faber & Faber, XS Noize will guide you through the all too short, yet tremendously fascinating life of Robert Johnson. The quality of this hardback graphic novel is second to none. The paper is of a high GSM reserved for the greatest artists and art pieces. The artwork, unlike the majority of newer graphic novels, closely resembles the old school classic comics. The first page shows a deftly drawn black and white charcoal drawing of a confident and dapper Robert Johnson at his peak, adorned in a slick striped suit, guitar in both hands with a cigarette in his mouth performing to an elated crowd. Solely focussing on Johnson’s face; one sees an uncanny resemblance to Dizzie Rascal. 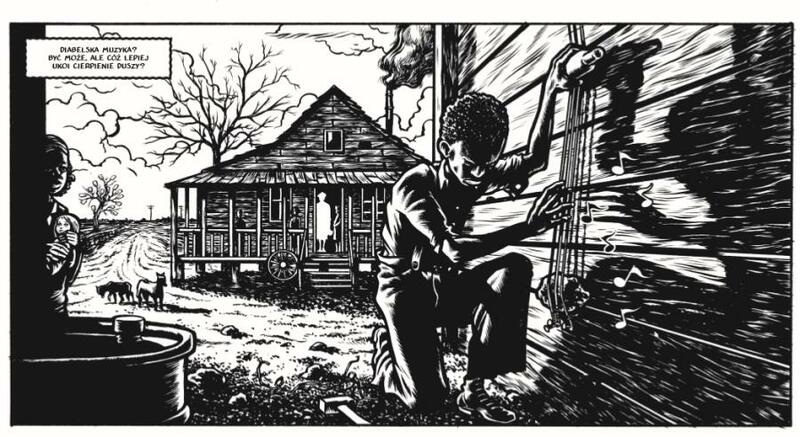 The book then goes back to 1907 (four years before Robert’s birth) to Hazelhurst, Mississippi. Robert’s surname would come from his step-father Noah, who as his biological dad before him, Noah would leave the family home. It’s a wonder how Johnson ever thrived as a musician. His mother’s new husband, Dusty Willis (who would not take to young Robert) discouraged Johnson from playing the “devils music”. Nonetheless, music would be Johnson’s destiny, school certainly wasn’t; he attended “as willingly as a whore to confession”. Despite being a poor student, Robert genuinely set out to live a good moral life by marrying a young girl called Virginia. Sadly, she would die at nineteen along with Johnson’s child she was carrying. This tragedy would make Robert “lose (his) taste for family life” and allow him to acquaint himself with (and take advantage of) the many women who then take to him. Despite his passion for the guitar; fans did not initially take to the way he played it and the church (at least where Robert was residing at the time) was active in its resistance against what they saw as “Satan Music”. It was only through guitar mentoring from Ike Zinnerman, taking to the road and meeting musicians Elmore James, Honeyboy Edwards, Howlin’ Wolf, Memphis Slim, Calvin Frazier and Johnny Shines; that opportunities opened up for him. Nonetheless, it is believed that if Johnson was not given the opportunity to record in San Antonio, Texas in November 1936; his impact on blues and music would have remained undocumented. Partly because he could be secretive “with a tendency to be dishonest”, by claiming to be related to Lonnie Johnson (who might have invented the guitar solo); much mystery surrounding Robert Johnson remains. Even the narrator is a mystery. A subtle clue is only revealed at the end of Love in Vain. It is alleged in this novel that Indian blood may run through Johnson’s veins. Apart from one person; Johnson never revealed his guitar techniques. His gambling debts, where he his lost money (which he believed could banish his demons), as well as his womanising, which included married women (despite remarrying a lady called Caletta), made Johnson many enemies. Someone attempted to poison him. Ironically he survived this poisoning, but would then die of pneumonia due to his body being ravaged by syphilis and alcohol. Despite only having one hit in his lifetime called Terraplane Blues, his genius has since come alive and through Love in Vain. Robert Johnson is deservedly recognised as “a great bluesman”. 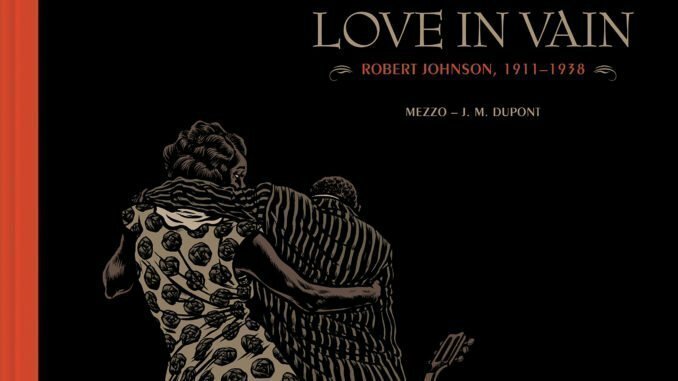 As well as telling Robert’s story, the lyrics to seven of his songs, including Terraplane Blues, are included alongside mesmerising charcoal art pieces.